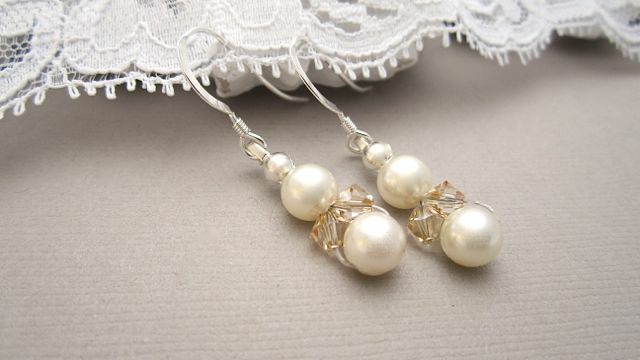 These pearl angel earrings are sweet yet very sophisticated. Shimmering Swarovski cream or white pearls are paired with sparkling crystals for a soft flattering look. The ear hooks are sterling silver. DIMENSIONS - These Earrings are approximately 20mm long and 6mm wide. These pearl angel earrings are sweet yet sophisticated. Shimmering silver and cream Swarovski Pearls are paired with silver shadow crystals for a soft flattering, smoky look. The ear hooks are sterling silver. The pearl angel earrings are sophisticated. Shimmering Swarovski silver pearls are paired with silver-grey sparkling crystals for a flattering and slightly vintage look. The ear hooks are sterling silver. The pearl angel golden shadow earrings pair up luscious cream Swarovski pearls with golden shadow crystals, perfect for a champagne and ivory colour scheme. The ear hooks are sterling silver.